Mango Lilikoi Gelato - with the warmer weather its time to drag out the ice cream machine. For those watching their sugar intake, you can easily use fat free half and half and your favorite sweetener ie. splenda or stevia. I would highly recommend the use of a pro-quality ice cream maker with a built in compressor. They are surprisingly affordable. The quality of the ice cream is so much better and you can make multiple batches without stopping. 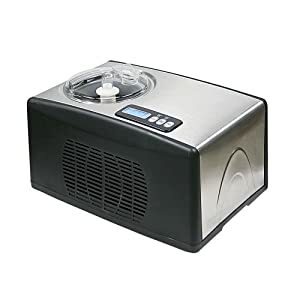 Order Professional Quality Ice Cream Maker - Make a spread of delectable desserts in about 30-40 minutes. This Self –freezing ice cream maker make spremium ice cream sorbets, Italian gelato, sherbets, fresh frozen yogurts and other treats. Offers premium features not found in budget ice cream makers including built-in powerful compressor freezer allowing continuous use without having to pre-freeze the mixing bowl.